To use an app metaphor, ArcTouch launched 10 years ago this week. Co-founders Eric Shapiro and Adam Fingerman had been unofficially working on iPhone app ideas for several months. But as the calendar turned towards 2009, things got serious as a real business opportunity emerged. So, the San Francisco-based technologists, best friends, and former college roommates hired a pair of smart young engineers living in Florianópolis, Brazil. One of them was Paulo Michels, now ArcTouch’s EVP of engineering. His first day was Feb. 9, 2009. 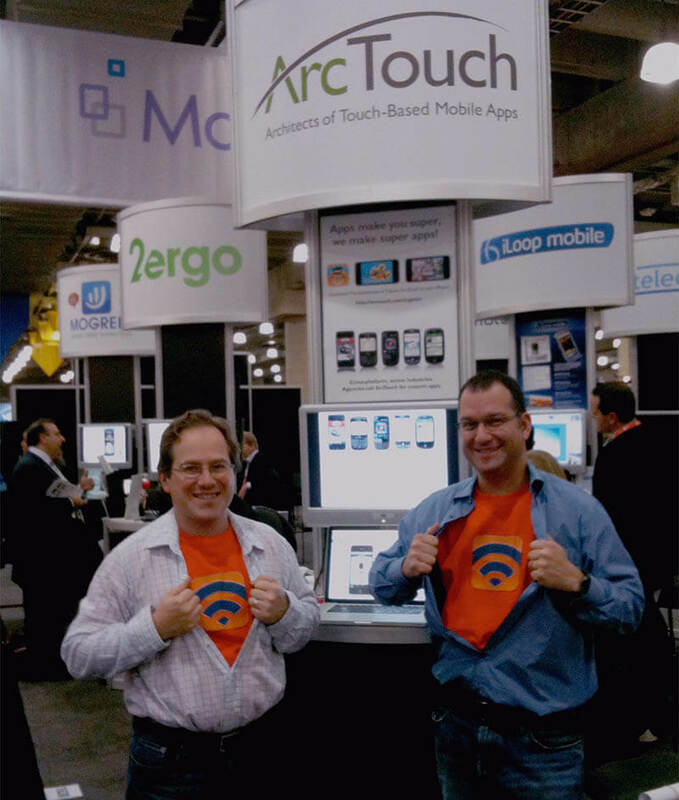 Those first hires, according to Fingerman and Shapiro, signified the real launch of ArcTouch. And it set the course for a company that would eventually become one of the world’s leading app development firms. In addition to the new hires, the co-founders rented part of a garage in a live/work loft at 3rd and Townsend Street in San Francisco — and put up the company’s first website. Fast forward to 2019, and ArcTouch is thriving. 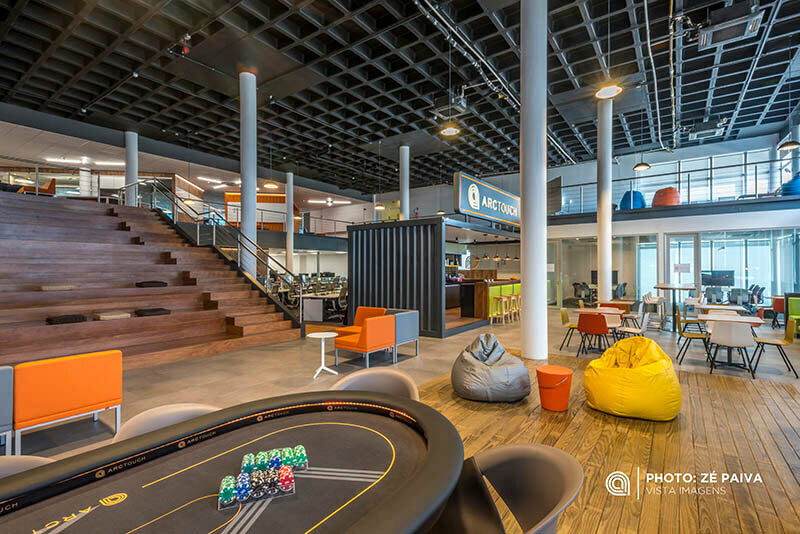 Now part of WPP, the largest network of marketing, design and technology consulting firms, ArcTouch has completed over 500 apps and technology projects for more than 150 clients, ranging from innovative startups to the Fortune 500. The digital products the company has built have been used billions of times over. And the ArcTouch team, split between the U.S. and Brazil, recently surpassed 200 strong. With startups that buck the odds and survive — and thrive — for as long as ArcTouch, there’s typically a fascinating back story. In their case, Shapiro and Fingerman readily admit the growth of the company wasn’t the goal when they started. They simply wanted to go to work in a place that wasn’t “toxic.” That’s the word they used to describe a previous startup where they both worked. At that company, Shapiro and Fingerman ultimately had irreconcilable differences with the other founders on the direction of the company and how to get there. Then there was an opportunity: In May of 2008, Apple announced it was creating an App Store for its new iPhone — and that developers could create and sell applications in the digital store. “We saw the future,” said Fingerman. “And it was apps. A personal computer in your pocket, powered by great software.” They felt this was going to be the next great revolution in technology, more impactful than the rise of the Internet in the late 90s, and they knew they had to be part of it. We recently sat down with the ArcTouch co-founders and still best friends after 33 years to talk about the company’s 10-year anniversary — and some of the challenges and achievements along the way. 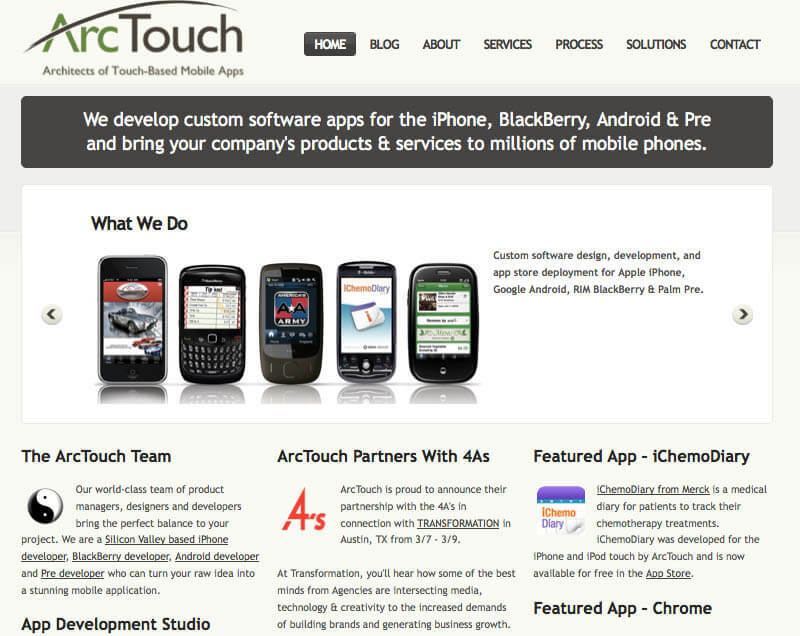 An early version of arctouch.com, circa 2009. Ten years ago, could you envision ArcTouch would have more than 200 employees and you’d serve over 150 clients? Eric Shapiro: No. We never thought the business would be more than five people. One guy that brings in business, two people that develop the software, and two people — Adam and I — that would basically run the company and be the product managers. We would come up with ideas, sketch them out, and direct the engineers. And we’d make a liveable salary. That was it. Adam Fingerman: Coming from the previous startup, we just wanted to build a company that would be fun, where we could work together and make decisions together. And, since I had two young children, I wanted to have the right amount of work-life balance so I could be there to see their activities and volunteer at the school and stuff like that. We just wanted to be in control of our own destiny. 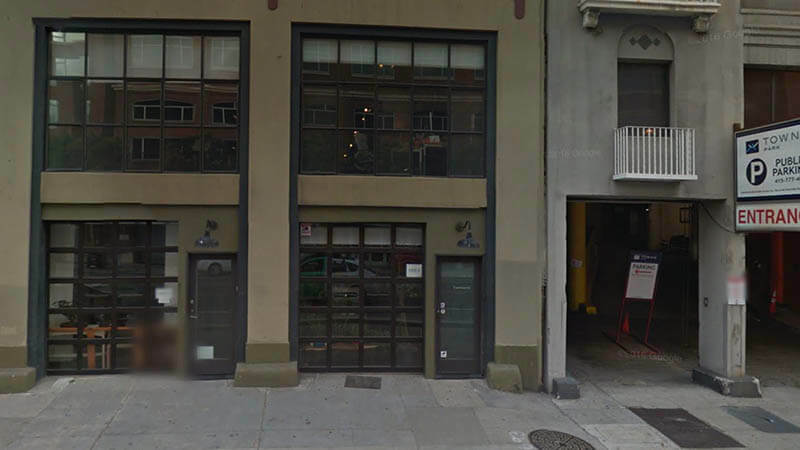 ArcTouch’s first office in 2009 (center) was a live-work loft on Townsend St. in San Francisco. So, with the introduction of the App Store, you had this inspiration to create a business by making apps. How did you think you’d make money? ES: We had this initial set of app ideas, and we thought some of them could sell for $100, and maybe some enterprise apps we could sell for several hundred dollars. And maybe some fun apps could be sold for $10. But never in our minds did we think that apps were going to sell for 99 cents — or be given away for free — because that just wasn’t how software was done. Adam and I had both worked at companies that sold software in the price range from $50 to $200 and $1,000 to $5,000, depending on whether it was consumer or enterprise. It was just a few weeks after the App Store launched that $100 app prices started dropping — they went to $90 and $80 and $50 and $10, and then 99 cents. We were blown away. We knew we couldn’t make sufficient revenue to build a business by selling 99 cent applications. That’s not saying it couldn’t be done. Game developers with home-run hits were having early success, but games were not an area where we had expertise. But we saw another opportunity: consulting. I had experience doing consulting for Java in the late ’90s when it was new. And I knew that if we could be the first mover as an app development consultant for other companies, we might have a chance to build something. 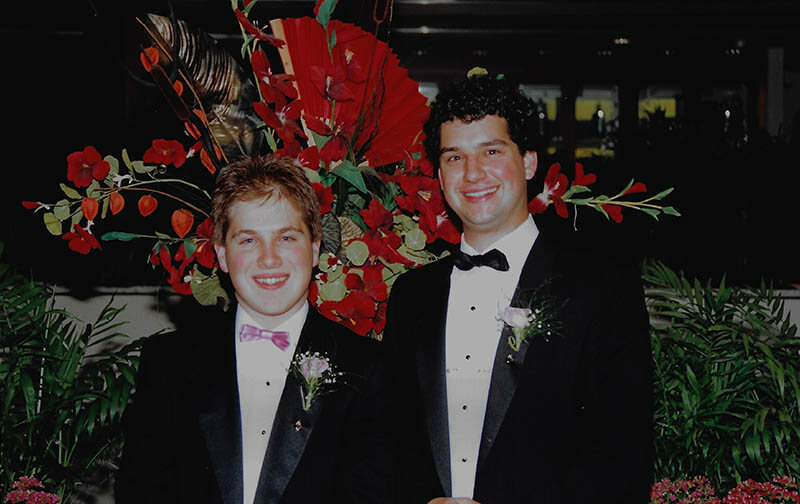 Fingerman (left) and Shapiro, at a Tufts University formal in 1988. Looking back over 10 years, what are some of the other surprises you’ve had? AF: At the time, you could go onto download.com and see the apps that were available from commercial and freeware vendors for Windows. And there were a few thousand, maybe. It was a complete surprise when we heard that there were 10,000 apps available on the App Store. And then 100,000 apps. And then 200,000 apps. Now, there are more than 2 million on iOS and Android. It’s incredible. What’s been the biggest challenge for you in growing ArcTouch? ES: For the first five years, all we needed to do was expand what we did — which was mostly coding mobile apps — so we hired more engineers. Somewhere around the fifth year into it, we realized that to really deliver great experiences, we had to add more functional capability. So we added designers, product strategists, and product planning. And around the seventh year, when we got acquired, we saw that consumer-focused applications and the public app stores were getting saturated. And so, we kind of shifted gears, and instead of making these consumer-focused apps that were more marketing related, we really focused on creating apps that were integral to our clients’ product lines. Meanwhile, we also started putting more resources into our enterprise business and employee-facing applications. And in the past year, we’ve also started work on blockchain projects. So, instead of just adding staff for our core business, we’ve seen a lot of growth in new business areas. And that’s been incredibly exciting — but that project diversity is also a big challenge. Our expertise needs to be much wider now than it ever has been. What is the biggest mistake that you’ve made in the first 10 years? AF: I don’t think that we marketed ArcTouch as aggressively as we could have early on. For the first few years, new clients were like fish jumping into the boat, and it was the right amount of fish for what we thought was necessary to have a healthy, fun business. We moved earnestly into content marketing about four years ago, and that has served us very well to stay ahead of the competition. But we could have started that even earlier if we wanted to grow the business even faster. ES: I agree with Adam. If we had put more energy and effort into marketing and sales, we could have grown this business faster, earlier. But you have to keep in mind that wasn’t our goal when we started. So, I’m reluctant to say that it was a mistake because we actually were operating the perfect, fun and balanced company that we wanted to run. Fingerman (left) and Shapiro at the AdTech conference in 2010. From where you sit today, do you think it’s easier to predict the next 10 years for mobile and the IoT than it was to anticipate the last 10 years? AF: I think it’s harder to look ahead now. We were pretty singularly focused the first 10 years on building the best mobile apps. We were just trying to do this one thing. It was easier to predict where things would go by tracking the growth patterns of the app stores and seeing data on how many apps people were downloading. Now we have to try to anticipate the future of mobile, and wearables, and connected products, and AI, and blockchain, and virtual reality, et cetera. So, it’s tough for the business to know which of those is going to be successful and which ones we should be focusing on. Eric, you’ve said that blockchain will be in many ways more disruptive than mobile, especially in terms of how we do business today. Why? ES: Blockchain as a technology will be disruptive to the way businesses and people perform transactions. Blockchain will decentralize how buying and selling of products and services are done. However, blockchain and cryptocurrency will require a generational shift for it to really become ubiquitous — something that will take 10-plus years before there’s mass adoption. We will see some niche, high-value blockchain use cases in 2019. We’re seeing more leading companies experimenting by building blockchain proof of concepts today than even a few months ago. I think where the industry is with blockchain is similar to where we were with mobile when we started ArcTouch 10 years ago. But even with this shift happening in the foundation of the technology and the way commerce is done, users will still interact primarily with apps. Blockchain is an underlying technology, not something the user needs to see. In the next 10 years, do you think there’ll be some other device or technology that will impact our daily lives as much as the smartphone? ES: The next magical device category that I hope to see more from is embeddable devices inside of humans. Not wearables — but devices that actually augment the human body. A smart contact lens will probably be one of the first game changers. The first iteration will be like Google Glass but on a lens — and over time, we’ll see the same kind of app explosion that we saw on the phone. But it all will happen in your eyes. And, I believe we’ll have widely used devices embedded inside the body to measure different vitals, things like medicine levels, blood cell counts, etc. There are already smart insulin meters that continuously read and help people adjust their diets. If you said 10 years ago were we going to embed devices in the body, I would have thought you were crazy. But it’s happening. AF: I am personally excited about the opportunities in voice-based applications for Amazon Echo or Google Home. Our Alexa developers have been working in this area for the past few years. A lot of app development companies have come and gone in 10 years. How has ArcTouch remained relevant where others have failed? ES: The main thing we did early on is — while everybody was trying to quickly produce a bunch of apps and make money on downloads — we focused on quality and experience. We never produced template style apps that could be re-used for businesses that didn’t care about the look and feel. We focused on high-quality, custom experiences — and we made sure people understood that we were a premium development firm. AF: Going back to some of the challenges we had with growth and scaling, we made a conscious effort to hire exceptional employees. We look for people who care about our clients’ business successes, and are committed to creating the best products possible. And we’ve remained true to our “North Star” — creating lovable apps that are the perfect blend of utility and delight. And I think we continue to be successful because we run a relatively flat organization. Everyone has a voice and influence over the product, and Eric and I remain personally involved in working with our clients. 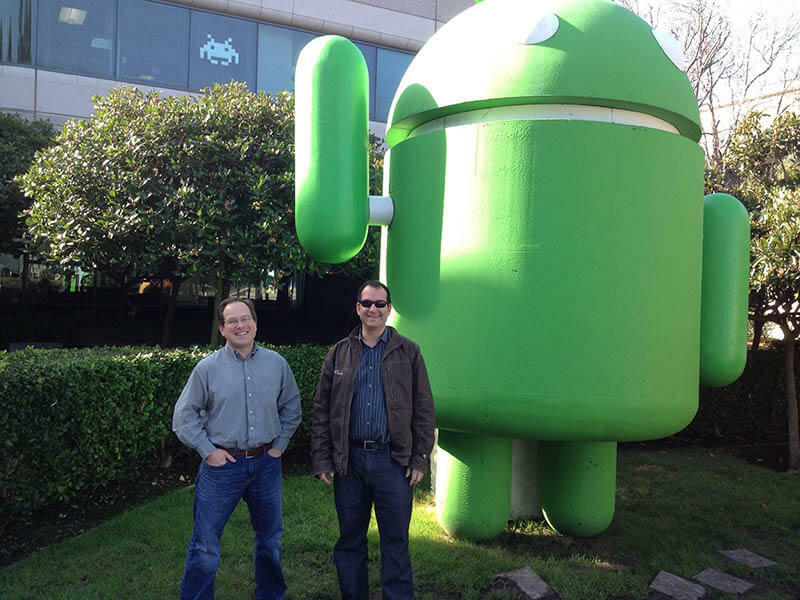 Fingerman (left) and Shapiro at Google (Android) headquarters in 2013. ArcTouch was independent for the first seven years and then was acquired by WPP in 2016. What’s been the biggest change in the last three years? AF: We continue to operate ArcTouch as a standalone entity and there haven’t been many changes for our team, or for our clients. Our Brazil office has really taken off. About a year ago we moved into an amazing new space and our team has grown 300 percent there. I think clients see it as a plus that we’re part of WPP. They get the best of both worlds — the white-glove attention of a boutique consulting specialist, with the strength and security of a billion-dollar global company behind it. ES: Well for me personally, I feel like I’ve become somewhat less involved in the individual app projects. Now I focus more on the strategic direction of the company and how we’re going to continue to grow at the pace that we want to grow. It’s exciting because I get to think about emerging technologies and the related business opportunities for us. We also have a much more mature operational system, thanks in large part to WPP. Our challenge has been to make sure that we still operate our company like a nimble start-up. And I think we’re succeeding. What do you think ArcTouch will look like in 10 years? AF: You know, I don’t expect us to continue at the same growth pace. But who knows? If you asked me eight years ago, I would have said that 20 people was a good size. I hope that 10 years from now we’re still building really lovable products that solve tough business problems. And that Eric and I are still working together. ES: In 10 years, I think that ArcTouch will become a five-person company, with just Adam and myself and two engineers and a salesperson [laughter]. But really, if we use the same growth pattern, I would expect the company to have — let’s see, 40,000 employees [more laughter]. I don’t think that’s quite right, either. But seriously, it’s hard to predict anything that far out when we’re in an industry that evolves so quickly. Truthfully, we generally don’t plan that far into the future — even a five-year horizon is very far. We think about things more like one or two years at a time. The new ArcTouch Brasil office space, in Florianopolis, opened in 2017. Okay, last question. What’s the one thing that you’re most proud of in the past 10 years? AF: I’m really proud of the hundreds of jobs we’ve created in the U.S. and Brazil, and the lives we’ve changed as a result of it. I’m proud of the connections we’ve forged with our teammates and with our clients. And I’m forever proud of the work we’ve done together. In Florianópolis, we’ve created a truly great place to work — we even got an award for it. We’re among the most desirable employers in Brazil, and that’s really an amazing feat. ES: I’m also really proud of the apps we’ve built and how they’ve changed companies’ fortunes and people’s lives in ways that we couldn’t have imagined 10 years ago. Even in our wildest dreams, we did not think there would be apps that help you track your exercise program, manage your home air quality, design and purchase a new outfit, and even book a luxury jet in an instant. If I’m at a cocktail party and someone asks me what I do, I rattle off a dozen apps that are completely recognizable — that these people probably have installed on their phones or tablets. And they’re amazed. That puts a big smile on my face, knowing we’re the ones that actually built those apps.